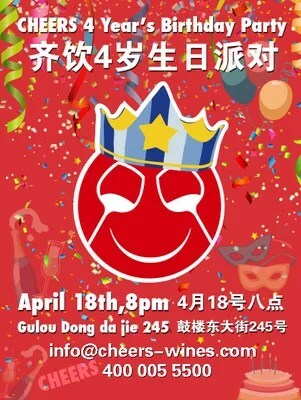 Beijing-based wine importer CHEERS will celebrate four years of business tonight with a party at its Gulou branch, one of more than a dozen shops the company has opened in the city since 2011. CHEERS targets younger consumers, stocks budget-friendly options from rmb29 per bottle, and offers free weekly wine tastings. Shops like the one in Sanlitun, a popular shopping and nightlife area, include patios or bars so customers can drink wine on premise. More recently, CHEERS has started to offer WSET courses, teamed its wines with events such as comedy shows, and launched shops beyond Beijing — the first opened in Chengdu last year and one in Shanghai is slated to open next month. A great deal of coverage of the China wine scene focuses on pricey brands or major producers and importers, but smaller players like CHEERS — not to mention its knockoffs: I’m told at least three operations have copied everything from CHEERS’ staff uniforms to the shop’s color schemes — are an intriguing part of this rapidly developing market. Also see this interview I did with co-owner Claudia Masueger, for Wine Business International last year. Note: I publish a free China wine e-newsletter every four to six weeks. Sign up by using this form.